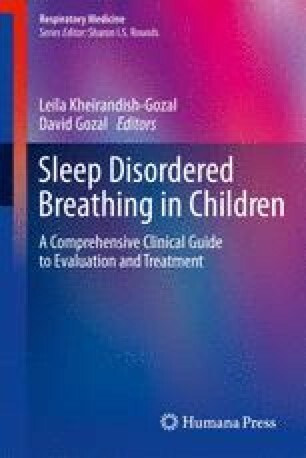 Orthodontic and craniofacial abnormalities associated with pediatric sleep-disordered breathing (SDB) are, despite their impact on public health, widely ignored: a narrow upper airway with maxillary constriction and/or some degree of mandibular retrusion is a common phenotype of pediatric obstructive sleep apnea syndrome (OSAS). In such cases, children are typically described as having a narrow, long face. Several anatomical and functional mechanisms may lead to OSAS in children and in adults, one being a smaller upper airway, which predisposes subjects to airway collapse during sleep in all age groups. Many studies based on cephalometrics indicate that children without congenital craniofacial anomalies may display subtle craniofacial morphometric features associated with SDB. Children with OSAS may have retrognathic mandibles and increased posterior facial height associated with severe tonsillar hypertrophy. Zucconi et al. described several craniofacial abnormalities pointing to a hyperdivergent skeletal growth pattern in children with OSAS, such as increased craniomandibular, intermaxillary, goniac, and mandibular plane angles. Whether this skeletal conformation is genetically determined or influenced by the early onset of habitual snoring has yet to be assessed. Many investigators suggest that these craniofacial changes may be mild and reversible after adenotonsillectomy (AT). It has recently been suggested that children with habitual snoring and OSAS have a special craniofacial morphology with a persistent abnormal mandibular development and malocclusion that may involve the jaws as well as the skeletal structures of the respiratory dynamics, thereby resulting in mandibular retroposition and leading to OSAS. Moreover, mandibular retroposition is also associated with posterior displacement of the tongue base, which further narrows the upper airway, predisposing it to collapse during sleep. Another common abnormality in patients with OSAS is a high-arched (ogival) palate, which results in posterior tongue displacement forcing the lateral palatine processes to expand over the abnormally placed tongue. Orthodontic treatment by means of oral devices is considered to represent a potential or supplementary treatment in children presenting with OSAS. Although the use of oral appliances has received relatively little attention in the literature, interest in this approach is growing rapidly. Oral appliances may improve upper airway patency during sleep by enlarging the upper airway and/or by decreasing upper airway collapsibility, thereby improving upper airway muscle tone. The treatment options available for growing children are rapid maxillary expansion, mandibular retropositioning, and a modified monobloc (MM). Rapid maxillary expansion (RME), which is a dentofacial orthopedic treatment procedure routinely used in young patients with constricted maxillary arches, is considered to be an effective treatment for OSAS in children.